Prices are for scores only unless otherwise noted. If price is for score only, call about purchase or parts or rental. A woodwind ensemble arranged by David McCoy. Instrumentation: fl, oboe, clar., horn, bass., organ. Version also available for double bass quintet ( in collection with PICNIC WITH SHEILAH and RING PLAY ). An arrangement of jazz works. Instrumentation: clar., trum., 2 alt. sax., ten. sax., drums, banjo, guitar, pno., str.. Still's work arranged by Cherie Fisk for oboe, viola and bassoon. An arrangement of Still's cantata for woodwind quintet by David McCoy. Includes flute, oboe/EH, clarinet, horn, bassoon and piano. See choral/orchestral section for purchase of choral parts. Publisher: WGSM. Instrumentation: fl., ob., pno., str. quartet. Publisher: WGSM. See THREE DANCES from Still's ballet, LA GUIABLESSE. Publisher: WGSM. Two versions of an excerpt from the ballet, MISS SALLY'S PARTY. Second version-fl., ob., pno., str. quartet, score only, no parts. Instrumentation: 1-0-1-0; solo alto sax, 4 saxes; 2-2-1-0; drums, banjo. Publisher: WGSM. Instrumentation: fl., pno., str. Publisher: WGSM. An arrangement of Still's Christmas songs for woodwind quintet by David McCoy. Score and parts for flute, oboe, clarinet, horn, bassoon and piano. See orchestral/choral section for purchase of choral parts. For guitar and flute as arranged by Benjamin Wilson. Publisher: WGSM. Still's DANZAS DE PANAMA arranged for saxophone quartet by Jack Sharretts. The fourth movement includes four marimbas. Publisher: WGS Music. Still's DANZAS DE PANAMA arranged for clarinet choir includes Still's TAMBORITO, MEJORANA Y SOCAVON, PUNTO and CUMBIA Y CONGO, with an introduction by James E. Mack. This piece is arranged for harp, piano, and quartet; or, harp and string orchestra. Duration: 15:50 min.s. Score $16. Score and parts for harp, piano and string quartet $68.00/one set. 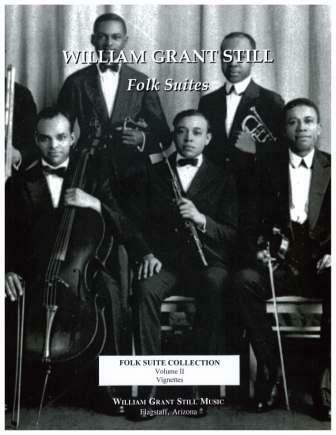 Contact William Grant Still Music for rental of harp and large orchestra version. Instrumentation: fl., pno., str. quartet. Duration: 8:52 min.s, Publisher: WGSM. Folk Suite #1 through #4 also available as a set--see Sheet Music Collections and Suites. Instrumentation 4: parts for clarinet and bassoon and piano. Instrumentation: fl., clar., cello, pno. or hp. Duration: 9 min.s, Publisher: WGSM. d) Peruvian Melody. As arranged by David McCoy. Instrumentation 3: parts for clarinet and bassoon and piano. c) Bow and Arrow Dance Song. Instrumentation: fl., ob., bass., pno. Duration: 5:04 min.s, Publisher: WGSM. c) Bow and Arrow Dance Song. As arranged by Tom Lloyd for woodwind quintet. Instrumentation: fl., ob., clar., horn and bassoon. c) Bow and Arrow Dance Song. As arranged by David McCoy. Instrumentation: fl., clar., cello, pno. Duration: 5:30 min.s, Publisher: WGSM. An arrangement of Still's FOLK SUITE #4 for woodwind quintet by Adam Lesnick ( Order #WW59551 ). Publisher: Intl Opus. Five Still works, arranged for oboe, viola and bassoon by Cherie Fisk. A work discarded by the composer owing to its inferior nature. Duration: 10 min.s, Publisher: WGSM. This segment from Still's MINIATURES as arranged by Cherie Fisk for oboe, viola and bassoon. An arrangement of the piece by the same name, by Anthony Griggs. Instrumentation: fl. or clar., 2 hp. Instrumentation 1 (original work): fl., ob., clar., bass., pno., str. quartet. Instrumentation 2: Still's work arranged by Cherie Fisk for oboe, viola and bassoon. Duration: 1:26 min.s, Publisher: WGSM. An arrangement of an excerpt from THE AMERICAN SCENE for orchestra. Instrumentation: 1-1-2-1; bar., ten., alt. sax. ; 2-2-3-1; timp., perc., 2 stick roll, cymb. Duration: 3:04 min.s, Publisher: WGSM. Still's classic piece for oboe arranged for flute choir by Claudia K. Bissett. Includes parts for solo piccolo, five flutes. Publisher: WGSM. Still's work for string quartet transcribed by Tom Lloyd for flute, oboe, clarinet, horn and bassoon. Publisher: WGSM. An arrangement of Still's LYRIC STRING QUARTET by Jack Sharretts. Includes parts for Eb clarinet, three Bb clarinets, alto clarinet and bass clarinet. Publisher: WGSM. Includes parts for saxophone quartet. Publisher: WGSM. This work is an excerpt from PATTERNS. Instrumentation: hp., str., sextet. Publisher: WGSM. e) Frog Went a Courtin'. Instrumentation: fl., ob., pno. ; bassoon part by Fred Thayer is also available from WGSM. Duration: 12:14 min.s, Publisher: Oxford Univ Press/WGSM. An arrangement of Still's MINIATURES for woodwind quintet by Adam Lesnick (Order #WW59615). Duration: 12:14 min.s, Publisher: Intl Opus. An arrangement of Still's ballet for woodwind quintet, piano and percussion, as done by David McCoy. Includes flute, oboe, clarinet (#7Bb and C1), horn, bassoon, piano and optional percussion. Publisher: WGSM. Excerpts from the SUITE FOR VIOLIN arranged by Adam Lesnick. - Version for flute and piano, order #FL95S7. - Version for clarinet and piano, order #CL9810. Duration: 10 min.s, Publisher: Intl Opus. An arrangement of an excerpt from SEVEN TRACERIES for piano. A version is also available for str. orchestra and piano. Duration: 7 min.s, Publisher: WGSM. Version for guitar and flute as arranged by Benjamin Wilson. Version also available for double bass quintet, in collection with ALL THAT I AM and RING PLAY. This piece is arranged for flute, string quintet and piano. Score $16, Score and parts for flute, piano and string quintet $68.00 / one set. An arrangement of "Procession of the Ants" by Don Wold. Instrumentation: For 2 trumpets, Fr. horn, trombone and tuba. An arrangement of "Ring Play" for double bass quintet, in a collection with ALL THAT I AM and PICNIC WITH SHEILAH. Instrumentation: fl., clar., hp., str. quintet. Versions of this piece are also available for string and full orchestras. Duration: 8 min.s, Publisher: WGSM. Instrumentation: chamber orchestra, 1-1-2-1; 2-1-2-0; hp., cel., str. Instrumentation: cl., alt. sax., ten. sax., trum., drums, conga drum, bongo drum, pno., guitar, banjo, str..
Instrumentation 1: fl., 2 clar., bass., hp., pno., str..
Instrumentation 2: fl., ob., clar., hn., bass., pno; as arranged by David McCoy. An arrangement of an excerpt from the THREE VISIONS for piano. Instrumentation: fl., hp., str. (v., vio., ce.). Duration: 6:00 min.s, Publisher: WGSM. An arrangement for woodwind quintet by Adam Lesnick (Order #WW59550). Duration: 6 min.s, Publisher: Intl Opus. An arrangement for wind ensemble by Dr. Dane Teter. Instrumentation: 3 fls., 2 obs., 6 clars., 2 bns., 4 saxes, 3 corns., 4 hns., 3 trmbs., eup., tuba, bass, timp., hp.. Duration: 6 min.s, Publisher: WGSM. Still's IF YOU SHOULD GO, SONG FOR THE LONELY, and BAYOU HOME as arranged by Adam Lesnick. - Version for oboe and piano, order #OB95S2. - Version for clarinet and piano, order #CL95S2. - Version for bassoon and piano, order #BSN9702. - Version for horn and piano, order #HN95S2. f) Garde Piti Mulet La (or Msieu Banjo). Instrumentation 1: ob., bsn., pno. Instrumentation 2: fl., ob., cl., hn., bsn., pno. As arranged by David McCoy. McCoy parts are also available for flute, or clarinet, bassoon and piano. An arrangement for Still's cantata for woodwind quintet by David McCoy. Includes parts for flute, oboe/EH, clarinet, horn, bassoon and piano. See orchestral/choral section for purchase of choral parts. Instrumentation: tenor, baritone, pno, fl., 2 clars., bass., str. quartet. Instrumentation: tenor, pno, fl., clar., bass., str. quartet. Instrumentation: pno., solo voice, str. quartet. Duration: 2 min.s, Publisher: WGSM. Instrumentation: fl., ob., pno., solo voice, str. quartet. An arrangement of an aria from the opera, COSTASO. Instrumentation: hp., str. quartet, sop. soloist. Instrumentation: pno., str. quartet, sop. soloist; or, str. quartet, mezzo-sop. ; or pno., str. quintet, mezzo-sop. ; or str. quintet, mezzo-sop. Instrumentation: pno., str. quartet, voice. Duration: 4 min.s, Publisher: WGSM. A Still work arranged by Sidney Sessoms. Still's arrangement of the J. Rosamond Johnson anthem. Instrumentation: fl., pno., str. (2 v., vio., ce., ba. ), voices. Instrumentation: pno., str. quartet, color. sop. soloist. Instrumentation: fl., 2 clars., bass., hp., pno., str., vocal soloist for "The Blind Man" segment. The contralto aria which brings the curtain down on the opera, TROUBLED ISLAND, with cont. and 5 strings. Leroy Osmon based these pieces on the work of William Grant Still.